The name V9 Bobber evokes concepts such as essentiality of line, purity of design and thus a certain original sportiness, underlined by a total matt black look. 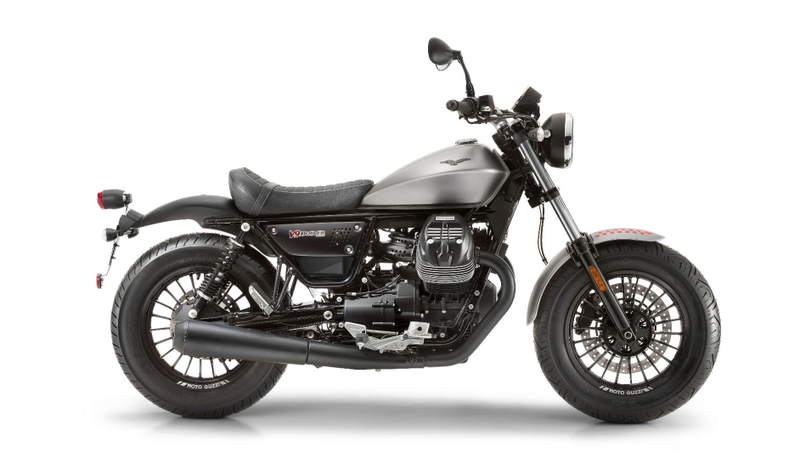 Moto Guzzi’s custom sports bike effectively creates the mid-size bobber series segment, in which the V9 ​​is currently the only representative. Bobbers appeared in the United States after World War II, created by passionate riders who stripped away all details superfluous to their goal of running fast on dirt tracks. To compete in these conditions the riders used to mount oversized tyres, giving the bikes a wide footprint. Following this style, the V9 Bobber abandons all chrome plating and glossy finishes for matt black details. The side panels and fuel tank are pitch black, with just a few graphic details in yellow or matt red. The exhaust unit, mirrors and both metal mudguards are painted in dark matt. The mudguard has been carefully shortened and reduced in size to make a big contribution to the minimal look of the V9 Bobber as well as housing a very compact optical unit. The 16-inch matt black rims are finely decorated with a grey Moto Guzzi logo and fit larger tyres (130/90 front, 150/80 rear). Even with these spectacular tyres and its distinctive design, the bike still provides exceptional riding pleasure and handling. Indeed the V9 Bobber is a true Moto Guzzi, and as such does not trade rideability for beauty. The V9 Bobber also differs from the V9 Roamer with its more crouched and sporty riding position, due to the low drag bar painted black and the long saddle. The ground clearance of the latter is only 770 mm, and if you add to this the exceptionally low kerb weight of 199 kg, you can easily imagine the level of comfort, control and rider pleasure offered by the V9 Bobber. In the upper part of the engine, the thermodynamics are completely new. Aluminium heads, pistons and cylinders are designed to make the most of the engine’s characteristics. Its cubic capacity is provided by bore and stroke values of 84×77 mm. Distribution is controlled by a pushrod system and there are two valves per cylinder set at an incline in the head (and no longer parallel, as on the V7 II engine). The fuel supply uses a one-piece Marelli electronic injection system. The electronic engine control unit is new. Of note is the presence in the entrance heads of the auxiliary air system, which, combined with the three-way catalytic converter, the double oxygen sensor and the total redesign of the engine, bring the twin 850 Moto Guzzi into compliance with EU4 standards. The unit is capable of 62 Nm of torque at just 3,000 revs/min, with a maximum power of 55 HP at 6,250 r/min, figures ​​that show Moto Guzzi’s commitment to achieving high levels of torque even at low rpms. This engine boasts surprising a character and responsiveness, which contribute to a really exciting riding experience. 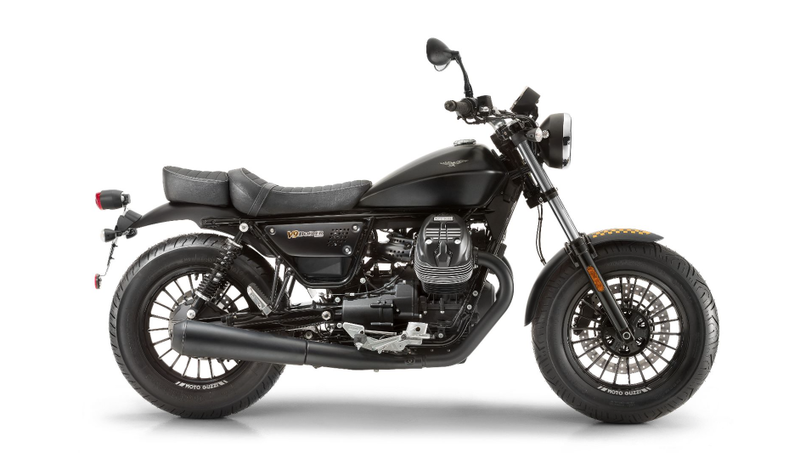 A version with the power limited to 35 kW is available, in line with the restrictions of an A2 licence and ideal for new Guzzi riders, who can also enjoy a record low total weight and the general ease of riding of both V9s. Another innovative aspect of the 850 Moto Guzzi engine is the 170 mm diameter single dry plate clutch, providing a perfect transmission of torque and power with no jerkiness or hesitation. This increases robustness and reliability over time and decreases the load on the handlebar lever, for better controllability and riding comfort. The six-speed gearbox is new, precise and with a soft clutch, which benefits from unprecedented ratios that make the most of the torque and engine power. The final transmission is carried out by a new double-jointed drive shaft offset by the increased size and the new bevel gear, which provides solid and reliable management of the powerful torque supplied by the twin engine. The cast aluminium swingarm has been designed and sized to support engine performance, as well as to accommodate the new 150 mm tyre.